Every year, colleges get more and more competitive as an increasing number of applicants have increasingly better resumés that strut their stuff to admission offices across the nation and beyond. However, some high schools still stick their heads in the sand and refuse to give students who are willing to go the extra mile the incentive or opportunity to do so. CHS is no exception to this paradox. Other schools that are more generous with advancing students at an accelerated rate can also see negative impacts to their student body when AP classes are offered too early. In order to forge a middle ground in between these two extremes, CHS should offer a weight to the “Honors” classes that they provide to underclassmen that matches the degree of difficulty presented in each class. By not providing a weight to classes such as Honors Freshman English or Honors World History, many students take the standard-level classes that are sometimes too easy for them and do not allow them to be exposed to more difficult material. This is due to the fact that they can still pass these classes with an A but still enter AP and IB classes later on down the road. Not only does this harm the student by keeping them away from more advanced classroom environments, but it may also lead their counselors or prospective colleges to decide that the student has not taken the most challenging coursework possible. On top of this, a number of honors classes have actually been weighted before at CHS, but have lost this attribute in recent years. Therefore, this disincentivization of rigorous courses harms both CHS and the students that attend it. On the other side of the spectrum, CHS is making the right choice by not offering too many AP classes to freshmen in particular. By taking an AP class and skipping out on classes meant for their grade, there is a high likelihood of a student getting a grade that they will be unsatisfied with. According to the Washington Post, freshmen that take AP classes have a 32% likelihood of getting a 1 out of 5 on the end of the year AP exam. With sophomores, the argument for more AP classes can be made with further reasoning behind it, but if there were more specifically weighted honors classes outside of AP and IB, underclassmen would have a higher likelihood of getting a grade that they feel comfortable with. Even if CHS were to put a weight on some of these classes, there is no guarantee that schools across the nation, more specifically the UC system, would accept this in the name of academic parity. For example, the UC system limits the amount of extra UC GPA points high school honors classes can give. However, even if they do not recognize the weight and deem that the curriculum being administered is difficult enough, they are still given an indicator on the students that are willing to take these classes. By adding a weight of 0.25 or 0.5 GPA points to these classes, more students who feel that taking rigorous classes would be a waste of time may be more inclined to take honors classes. This will cause an influx of new applicants that will enroll in AP and IB courses after taking and passing honors-level courses. 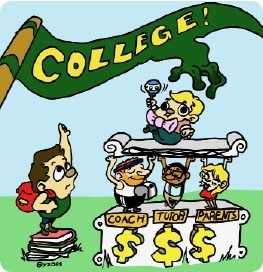 As college admissions offices step up their standards, CHS must adapt to fit the new norm and allow their students a chance at advancing themselves at a rate that will not result in them taking classes that are far too strenuous for them. When considering that the future of CHS students is at stake, prioritizing their academic success by weighing honors-level classes should be a no-brainer.